Welcome to our spring brochure, which is full of live music, dance and comedy, plus international performances beamed onto our cinema screen via satellite. With the worst of winter now behind us, it’s time to start looking for some heart-warming entertainment… and Wyeside is here to provide it. At the time of going to print, in the light of uncertainty surrounding Powys County Council’s 2019/20 budget and the possible effect on current level of support for the Arts and Culture Service in Powys, we have unfortunately needed to take precautionary steps to safeguard Wyeside’s operations. We have therefore decided to reduce our operating hours for the duration of this brochure to save on staff and operating costs, pending further news from Powys County Council, and have also made the difficult decision to remove the family cinema ticket option. We have done our absolute best to protect the variety of the programme we have on offer to our community, and sincerely hope that these actions affect our customers as little as possible in these circumstances. We will of course keep you posted as our position becomes clearer. Sat 28 September: 7.30pm £20 Jon Boden, best known as the lead singer of the progressive folk juggernaut Bellowhead, launched his solo career in 2016. Presenting the self-penned songs of the albums Painted Lady and Songs From The Floodplain and latest album Afterglow, material from Bellowhead, Spiers & Boden and his A Folk Song A Day project, his critically acclaimed and enthusiastically received solo shows have created yet another chapter in his history as one of the foremost names in English folk music. Blurring boundaries and borders, inspired by the music and poetry of Wales and the UK. World music collective Kabantu joins forces with innovative Welsh chamber orchestra Sinfonia Cymru to blur the boundaries between genres, taking inspiration from the music and poetry of Wales and the rest of the UK. Featuring brand new music, written and devised by the players from both ensembles, including new versions of the songs Sospan Fach, Suo Gan and Dafydd y Garreg Wen, Close to Folk is a stunning celebration of people and culture. MARK WATSON THE INFINITE SHOW Sat 5 Oct: 8pm £19 Age Guidance: 14+ Cluster-bombed with yoghurt on ‘Taskmaster’, half-killed on ‘Bear Grylls’ Celebrity Island’, Watson returns to what does best: being indoors. Inspired by the mostly alarming state of the world his children are growing up in, and a genuine, urgent desire to do something about it, this show is about empathy. 99 percent of the world’s population is made up of other people: why can’t we understand them? As scrawny and impassioned as ever, one of the UK’s most beloved and thinnest acts offers some suggestions, with his usual notoriously high joke-and-rant-per-minute rate. Progressive rock flute player, guitarist, keyboard player and singer, John is best known for his work with his brother Steve Hackett, the former Genesis guitarist. Since 1975 he has recorded and toured with Steve in Europe, USA and Japan alongside a career as a solo flautist and session player. Faustus are an English traditional folk trio, nominated in the 2009 BBC Radio 2 Folk Awards, featuring Benji Kirkpatrick (Seth Lakeman Band, Bellowhead), Saul Rose (Waterson:Carthy, Whapweazel) and Paul Sartin (Bellowhead, Belshazzar’s Feast). 2005 saw the release of John’s first solo rock album “Checking Out Of London” which was given five stars in Record Collector magazine. The Kentish Spires collectively bring a vast wealth of musical experience – weaving woodwind and reed instruments over a solid foundation of guitar, bass and drums – with era-appropriate synths and powerful female vocals. THE WIZARD OF OZ Fri 8 November: 7.30pm £15 Full (£14 Concession) Join Ballet Theatre UK as they follow the yellow brick road and discover all the wonders of Oz. Enjoy Dorothy, the Scarecrow, Tinman, and Lion, (and yes Toto too) as they seek the Wonderful Wizard to find that there’s no place like home! The Wizard of Oz is a two act, fulllength, ballet adaptation of the iconic tale by L. Frank Baum, told through the magic of classical dance. Set to a classical score which brings the story to life, this production is family friendly and is the perfect way to introduce children to ballet. Wyeside has always boasted you don’t have to live in the big city to be able to enjoy the best Arts & Entertainment. But, of course, the huge casts and major international stars of ballet, opera and classical theatre have always been rare treats. REMBRANDT From the National Gallery, London and Rijksmuseum, Amsterdam Tue 9 April: 7.30pm £12.50 Full (£11.50 Concession) This Exhibition on Screen favourite makes a welcome return to the big screen marking the 350th anniversary of Rembrandt’s death. Every Rembrandt exhibition is eagerly anticipated but this major show hosted by London’s National Gallery and Amsterdam’s Rijksmuseum was an event like no other. Given privileged access to both galleries, this film documents the landmark exhibition whilst interweaving Rembrandt’s life story, with behind-the-scenes preparations at these world-famous institutions and contributions from specially invited guests, including curators and leading art historians. ALL ABOUT EVE by Joseph L Mankiewicz LIVE Thu 11 April: 7pm £13.50 Full (£12 Concession) Gillian Anderson (X-Files, NT Live: A Streetcar Named Desire) and Lily James (Mamma Mia! Here We Go Again) lead in All About Eve, broadcast live to cinemas from the West End in London. All About Eve tells the story of Margo Channing. Legend.True star of the theatre.The spotlight is hers, always has been. But now there’s Eve. Her biggest fan.Young, beautiful Eve.The golden girl, the girl next door. But you know all about Eve…don’t you…? Ivo van Hove directs this new stage version with music from double Mercury Prize-winner PJ Harvey. AS LIVE Sun 28 April: 2pm £13.50 Full (£12.50 Concession) Back by popular demand,The King and I returns to Wyeside! The multi-award-winning production comes to cinemas from London’s iconic Palladium. Tony Award-winning Kelli O’Hara (Anna) takes to the stage alongside Tony and Oscar nominee Ken Watanabe (The King) in a “powerhouse” (The Times) performance. Set in 1860s Bangkok, the musical tells the story of the unconventional and tempestuous relationship that develops between the King of Siam and Anna, a British schoolteacher. With one of the finest scores ever written, and featuring a company of over 50 world-class performers,The King and I is a testament to the lavish heritage of romantic musical theatre. FAUST Music by Charles-François Gounod Opera in five acts Sung in French (with Subtitles) AS LIVE Thu 2 May: 6.45pm £17 Full (£15 Concession) Experience the decadence and elegance of 1870s Paris in David McVicar’s spectacular production of Gounod’s best-loved opera. There are many versions of the story of Faust, who trades his soul with the Devil for youth and power, but Gounod’s opera remains one of the most constantly enthralling. Michael Fabiano stars as Faust, with Diana Damrau as his beloved Marguerite and Erwin Schrott as the diabolical Méphistophélès. Virtuoso leading roles, a large chorus, sensational sets, ballet and an ecstatic finale make this the epitome of theatrical spectacle. Above all, the music includes several of popular opera’s most recognizable numbers, performed by a cast of great international singers and the Royal Opera Chorus. Broadcast live from The Old Vic in London, Academy Award-winner Sally Field and Bill Pullman star in Arthur Miller’s blistering drama. America, 1947. Despite hard choices and even harder knocks, Joe and Kate Keller are a success story.They have built a home, raised two sons and established a thriving business. But nothing lasts forever and their contented lives, already shadowed by the loss of their eldest boy to war, are about to shatter. Two recent works and one world premiere showcase the contemporary face of the royal ballet. Christopher Wheeldon’s Within the Golden Hour is based around seven couples separating and intermingling, to music by Vivaldi and Bosso and lit with rich colours suggested by sunset. Crystal Pite’s Flight Pattern uses a large dance ensemble and Górecki’s familiar music from his Symphony of Sorrowful Songs for a poignant and passionate reflection on migration. Between them, a new work created on The Royal Ballet by the acclaimed choreographer Sidi Larbi Cherkaoui has its premiere to bring the contemporary truly up-to-date. VAN GOGH & JAPAN AS YOU LIKE IT by William Shakespeare AS LIVE Wed 22 May: 7.30pm £13.50 Full (£12 Concession) Come into the forest; dare to change your state of mind. Rosalind is banished, wrestling with her heart and her head.With her cousin by her side, she journeys to a world of exile where barriers are broken down and all can discover their deeper selves. Director Kimberley Sykes (Dido, Queen of Carthage) directs a riotous, exhilarating version of Shakespeare’s romantic comedy. AS LIVE Tue 4 June: 7.30pm £12.50 Full (£11.50 Concession) “I envy the Japanese” Van Gogh wrote to his brother Theo. In the exhibition on which this film is based - VAN GOGH & JAPAN at the Van Gogh Museum in Amsterdam - one can see why. Though Vincent van Gogh never visited Japan it is the country that had the most profound influence on him and his art. One cannot understand Van Gogh without understanding how Japanese art arrived in Paris in the middle of the 19th century and the profound impact it had on artists like Monet, Degas and, above all,Van Gogh. The film travels not only to France and the Netherlands but also to Japan to further explore the remarkable heritage that so affected Van Gogh and made him the artist we know of today. 2019 GREATEST HITS TOUR LIVE Sat 8 June: 8pm £15 Full (£13 Concession) Celebrating 30 incredible years,Take That are bringing their huge 2019 Greatest Hits tour to cinemas for one night only! Broadcast LIVE on Saturday 8 June, you’ll have front row seats as Gary, Mark and Howard perform their biggest hits from the last three decades. Get ready to throw your hands in the air – this is one party you’ll never forget! In a reimagined 1590, England is a matriarchy. Baptista Minola is seeking to sell off her son Katherine to the highest bidder. Cue an explosive battle of the sexes in this electrically charged love story. Justin Audibert (Snow in Midsummer,The Jew of Malta) turns Shakespeare’s fierce, energetic comedy of gender and materialism on its head to offer a fresh perspective on its portrayal of hierarchy and power. Double-meanings, disguises and dirty laundry abound in The Merry Wives of Windsor as Sir John Falstaff sets about improving his financial situation by wooing Mistress Page and Mistress Ford. But the ‘Merry Wives’ quickly cotton on to his tricks and decide to have a bit of fun of their own at Falstaff’s expense. Directed by Nicole Charles and Elle While, and staged at the beautiful and iconic Globe Theatre in London, this new production of The Merry Wives of Windsor will be broadcast live and will feature exclusive behind-the-scenes insights into the play. SMALL ISLAND adapted by Helen Edmundson AS LIVE Thu 27 June: 7pm £13.50 Full (£12 Concession) Andrea Levy’s Orange Prize-winning novel Small Island comes to life in an epic new theatre adaptation. Small Island embarks on a journey from Jamaica to Britain, through the Second World War to 1948 – the year the HMT Empire Windrush docked at Tilbury. The play follows three intricately connected stories. Hortense yearns for a new life away from rural Jamaica, Gilbert dreams of becoming a lawyer, and Queenie longs to escape her Lincolnshire roots. Hope and humanity meet stubborn reality as the play traces the tangled history of Jamaica and the UK. A company of 40 actors take to the stage of the National Theatre in this timely and moving story. This thrilling, audacious and witty production is perhaps still best known for replacing the female corps-de-ballet with a menacing male ensemble, which shattered convention, turned tradition upside down and took the dance world by storm. Collecting over thirty international accolades including an Olivier Award and three Tonys on Broadway, Matthew Bourne’s powerful interpretation of Tchaikovsky’s beloved tale is ‘still original, still unmissable’ (★★★★★ Metro), a passionate and contemporary Swan Lake for our times. MAASTRICHT CONCERT 2018 SHALL WE DANCE? AS LIVE Thu 22 August: 7pm AS LIVE Sun 25 August: 2pm £16 Full (£15 Concession) André Rieu’s annual hometown Maastricht concerts attract fans from all corners of the globe.The medieval town square is transformed into a spectacular backdrop for unforgettable concerts filled with humour, fun and emotion for all ages – and, of course, magnificent music. This year André Rieu invites you to put on your dancing shoes for his spectacular 2019 hometown concert from Maastricht: ‘Shall we Dance?’ Summer nights are made for dancing and this is a party you do not want to miss! Prepare to be swept off your feet by this magical celebration of dance on the big screen in the comfort of your local cinema. Join André Rieu, his Johann Strauss Orchestra, world class sopranos,The Platin Tenors and special guests for a magical cinema experience. Audiences will be treated to behind the scenes content and an exclusive interview with André and as always, some delicious surprises. CINEMA APRIL – JUNE 2019 WHAT MAKES OUR CINEMA SPECIAL? We don’t charge extra for our 3D glasses – everything’s included in your ticket price Our building is fully licensed, which means you cwtch up to a good film with a lovely glass of merlot All our cinema ushers are volunteers Wyeside is one of the oldest cinemas in Wales - showing all the best films for over 100 years REMEMBER - Our films start at the advertised time - the adverts start 10 mins earlier. Film times, prices and certificates are correct at going to press, but may change beyond our control. We suggest you check with the Box Office (or our website), especially if you’re coming a long way. ALL FILM SCREENINGS HAVE ALLOCATED SEATING, SO MAKE SURE YOU BOOK EARLY TO GET YOUR FAVOURITE SEAT!  he auditorium lights being kept on T at a low level throughout the film The sound level of the film being kept quieter than usual An acceptance of increased levels of movement and noise in the auditorium during the screening. SUBTITLED SCREENINGS Subtitled screenings provide a transcription of the audio from a film, displayed at the bottom of the cinema screen, to benefit people who are hard of hearing. Along with the dialogue from the film, the subtitles include non-dialogue audio such as “(sighs)” or “(door creaks)”. A quirky period comedy from the director of The Lobster, staring Olivia Colman (in a performance which has won her the Oscar for Best Performance by an Actress in a Leading Role) as a frail Queen Anne opposite Rachel Weisz’s close friend Lady Sarah, who must put up with the Queen’s mercurial temper while governing the country in her stead. When a new servant, Abigail (Emma Stone), arrives, Lady Sarah takes her under her wing, and Abigail sees a chance to return to her aristocratic roots. A gender flipped reimagining of the 2000 film What Women Want. After getting passed over at work for a promotion, a female sports agent is given the magical ability (by a psychic Erykah Badu) to hear men’s inner thoughts. She decides to make the most of her newfound ability to turn the tables on her overbearing male colleagues. SCREENINGS: Mar: 17, 26. April 6, 7, 10. SCREENINGS: Apr: 12, 13, 14, 15, 16, 17, 18. WONDER PARK (TBC) Time tbc | USA | Brianna Denski, Jennifer Garner, Ken Hudson Campbell A young and imaginative girl named June spent her childhood days constructing a toy amusement park filled with fantastical rides and inhabited by talking animals. Once she’s grown up a little, she wants to leave the park and her childish games behind her, but one day discovers that her Wonderland amusement park has come to life in the woods. And the park and its animals need her help to stop it being destroyed by the Chimpanzombies. SCREENINGS: Apr: 12, 13, 14, 15, 16, 17, 18, 19, 20, 21, 22, 23, 24, 25, 26, 27. May: 12, 19. When Pete and Ellie decided to become foster parents they planed to take in one child, but suddenly find themselves caring for three kids. Pete and Ellie must learn the ropes of instant parenthood fast in this hilarious and touching comedy based on a true story. Dancer Rudolf Nureyev was widely regarded as the greatest male ballet dancer of his generation. A wild and beautiful dancer limited by the world of 1950s Leningrad, he begins to flirt with Western artists and ideas leading him into a high-stakes game of cat and mouse with the KGB. His eventual escape to the West stunned the world at the height of the Cold War. SCREENINGS: Apr: 19, 20, 21, 22, 23, 25. Billy Batson is a streetwise 14-year-old who has just moved to the latest in a string of foster homes when he is chosen to become a superhero. Magically transforming by shouting the word Shazam! Billy and his new foster brother Freddy Freeman must learn what Billyâ&#x20AC;&#x2122;s new powers are and how to use them time to stop the villain Dr. Thaddeus Sivana. SCREENINGS: Apr: 19, 20, 21, 22, 23, 24, 25. May: 5. SCREENINGS: Apr: 19, 20, 21, 22, 23, 24, 25. HELLBOY (TBC) Time tbc | USA | Dir Neil Marshall | Milla Jovovich, David Harbour, Ian McShane In this Hellboy reboot, the creator of the original graphic novel has also written the screenplay, which promises to be the truest yet to the comics on which they are based. David Harbour (Stranger Things) plays Hellboy and Milla Jovovich (Resident Evil, The Fifth Element) is the Blood Queen, a medieval sorceress bent on destroying humankind. SCREENINGS: Apr: 26, 27, 28, 29, 30. May: 1, 11. AVENGERS: ENDGAME (TBC) Time tbc | USA | Dir Anthony Russo & Joe Russo | Brie Larson, Evangeline Lilly, Bradley Cooper Adrift in space with no food or water, Tony Stark sends a message to Pepper Potts as his oxygen supply starts to dwindle. Meanwhile, the remaining Avengers - Thor, Black Widow, Captain America and Bruce Banner - must figure out a way to bring back their vanquished allies for an epic showdown with Thanos, the evil demigod who decimated the planet and the universe. May: 1, 2, 3, 4, 5, 6, 7, 8, 9, 11, 12, 18, 19, 30, 31. SCREENINGS: May: 3, 4, 5, 6, 7, 9. SCREENINGS: Apr: 26, 27, 28, 29, 30. It’s 1851, and Charlie and Eli Sisters (Joaquin Phoenix and John C. Reilly) are brothers, and assassins. Boys grown to men in a savage and hostile world, the Sisters brothers find themselves on a journey through the Northwest, an adventure on which each increasingly questions the other’s methods. A reimagining of the cinematic Western as a dangerous, witty, and emotionally cathartic exploration of what it means to be a man. Also starring Jake Gyllenhaal and Riz Ahmed. PEPPA PIG FESTIVAL OF FUN (TBC) Get ready for Peppa’s big celebration as she comes to cinema screens to celebrate 15 years of Peppa Pig! Join the party with Peppa and George in their brand new adventures as they dance in the mud at a children’s festival, celebrate Grandpa Pig’s birthday at a restaurant for the first time, and take a trip to the cinema to see Super Potato’s big movie feature! 10 brand new episodes including a 2-part festival special, as well as exclusive new interactive entertainment. SCREENINGS: May: 4, 5, 6, 11, 18. Wild Rose is a comedy-drama that tells the story of Rose-Lynn, a woman from Glasgow bursting with talent and charisma. On a quest to become a country music star, she must first grapple with the responsibility of being the young mother of two children and the aftermath of recently being released from prison. Jordan is a no-nonsense mogul who bullies anyone who crosses her path. When she unexpectedly transforms into a 13-year-old version of herself, life cannot continue as normal. The tables are turned when her long-suffering assistant becomes her guardian and she attempts to adjust to life back at school. Based on Black-ish star Marsai Martin’s original idea and starring her as the young Jordon, from the makers of Girls Trip, Black-ish and Ride Along. SCREENINGS: May: 10, 11, 12, 14, 15, 16, 18, 29. SCREENINGS: May: 10, 11, 12, 15. Biopic about one of the most celebrated authors of the 20th century, J.R.R. Tolkien (The Hobbit, The Lord of the Rings), focusing on his formative years as he finds friendship, love and artistic inspiration among a group of fellow outcasts at school and his experiences of the first world war. A fascinating insight into the events that drove this young soldier to conjure the magical, ethereal, quasi-medieval world of Middle-earth and the intricate details of its sprawling mythology. Red Joan stars Dame Judi Dench as Joan Stanley in a story based on the real-life figure Melita Stedman Norwood who, in her late 80s, was exposed as the KGBâ&#x20AC;&#x2122;s longest serving British Spy. The film charts her journey from Physics student at Cambridge University in the 1930s and a love affair with a young communist to her work in a top secret nuclear research facility and the dilemmas she met in the face of terrifying advancements in nuclear capabilities. A live-action retelling of the 1992 Disney classic of the same name. Featuring classic songs from the original and brand new music, this is a musical romantic fantasy adventure about a street urchin who falls for the Sultanâ&#x20AC;&#x2122;s daughter. Directed by Guy Ritchie and starring Will Smith as the Genie alongside Mena Massoud, Naomi Scott, Marwan Kenzari, Navid Negahban, Nasim Pedrad, Billy Magnussen, and Numan Acar. SCREENINGS: May: 17, 18, 19, 21, 22, 23. SCREENINGS: May: 17, 18, 19, 21, 23, 31. SCREENINGS: May: 24, 25, 26, 27, 28, 29, 30, 31. Jun: 1, 2, 4, 5, 6, 8, 9, 15. Based on the true story of internationally renowned Cuban ballet star Carlos Acosta (and on his 2007 memoir No Way Home),Yuli stars Acosta as himself, looking back over his career. The film depicts his early life as a naturally gifted, but reluctant dancer forced to join ballet classes and later leave his beloved Cuba to become one of the world’s leading dancers, performing with companies such as The Royal Ballet, The English National Ballet and Sadlers Wells. Former Pokémon Trainer Tim Goodman goes insearch of his father, prominent detective Harry Goodman, after he disappears in a car crash. Also looking for Harry is his Pokémon partner, Detective Pikachu. For some reason, Tim is the only person in the city able to understand Detective Pikachu, and they reluctantly team up. Chasing clues through the streets of Ryme City, the dynamic duo uncover a devious plot that poses a threat to the Pokémon universe. SCREENINGS: May: 25, 26, 27, 28. SCREENINGS: May: 25, 26, 27, 28, 29, 30, 31. Jun: 1, 2, 8, 9, 15, 16. ROCKETMAN (TBC) Time tbc | UK, USA | Dir Dexter Fletcher Taron Egerton, Richard Madden, Bryce Dallas Howard An epic musical fantasy telling the uncensored human story of Sir Elton John’s breakthrough years. From his time as a prodigy at the Royal Academy of Music, through his influential and enduring musical partnership with Bernie Taupin, the film also charts his struggles with depression, substance abuse and his road to accepting his sexual orientation. SCREENINGS: Jun: 7, 8, 9, 11, 12, 13, 15, 16, 22. SCREENINGS: Jun: 14, 15, 16, 18, 19, 20, 22. The Secret Life of Pets 2 follows the 2016’s blockbuster about the lives our pets lead after we leave for work or school each day. We take another hilarious look inside the minds of our furry friends. From the creators of the Despicable Me series. Featuring the voices of Kevin Hart, Harrison Ford and Tiffany Haddish. JOHN WICK: CHAPTER 3, PARABELLUM (TBC) Time tbc | USA | Dir Chad Stahelski Keanu Reeves, Jason Mantzoukas, Halle Berry In this third instalment of the adrenaline-fueled action franchise, legendary super-assassin John Wick (Reeves) returns with a $14 million price tag on his head and an army of bounty-hunting killers on his trail. After being banished by the shadowy international assassinâ&#x20AC;&#x2122;s guild, John Wick seeks help from fellow assassin Sofia (Berry), and her dogs! SCREENINGS: Jun: 14, 15, 16, 18, 19. SCREENINGS: Jun: 21, 22, 24, 25, 26. SCREENINGS: Jun: 21, 22, 23, 24, 25, 26, 27. A 4 week course beginning April 30th. Sessions run from 7pm to 8pm Tuesday evenings. An 8 week course beginning September 3rd. Sessions run from 7pm to 8pm Tuesday evenings. Crochet Sampler Blanket or scarf (Project lessons), £56 A 7 week course beginning June 4th. Sessions run from 7pm to 8pm Tuesday evenings. Contact Vicki Gregory directly at info@missgregorys gorgeousgifts.co.uk for further information or to book your place. COMMUNITY GROUPS | CLASSES | EVENTS Did you know Wyeside also offers a range of regular community classes and workshops? Find out more information by contacting the co-ordinators directly. HAVE-A-GO SHAKESPEARE! Have-a-go Shakespeare meet in the Wyeside Gallery on alternate Friday mornings during term time from 10.30am till 1pm, to explore Shakespeare text in reading and performance. Please come along and join in, or if you’d like to speak to someone first call Phil Bowen or Sue Best at Shakespeare Link, Willow Globe Theatre, on 01597 811487. £5 per workshop. Wyeside is an independent not-for-profit charity - so every penny we make goes straight back into our programme. We couldn’t manage without our funders - and the fantastic help and support we get from our incredibly loyal band of Friends and Volunteers. THANK YOU ALL! FRIENDS OF WYESIDE The Friends’ subscriptions provide additional funding for special projects. In the past these have included match funding for recent major improvements to the arts centre building and facilities, including the refurbishment of the Market Theatre and Gallery, the installation of digital projection equipment, the new artists’ space, Window on the Wye, and repairs and renovations to the stonework of the historic building. Donate from £5 per month (£60 per year), or whatever you would like to give! WHAT ARE THE BENEFITS? Apart from playing a vital role in our future, Friends organise special events, receive quarterly newsletters from Wyeside, are entered into a monthly draw for free tickets, and will receive the brochure hot off the press! HOW DO I JOIN? 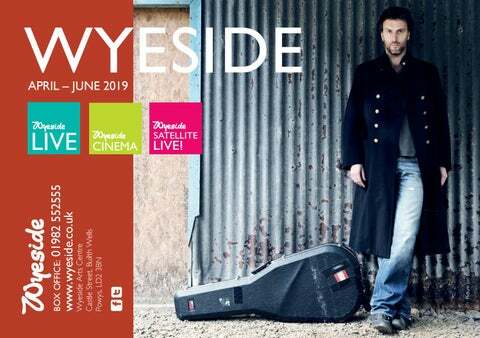 If you would like to become a Friend of Wyeside either pop in and pick up a form from the box office, download one from our website, or request one from Miriam Hall by calling 01982 553668, or by emailing marketing@wyeside.co.uk. VOLUNTEERS Wyeside’s volunteers play a vital role in our continuing success. They help us in myriad ways - stewarding for live events and films, working on our bars, or helping our publicity efforts. We give training to develop your skills and CV. You get to see live events and films free, and the chance to work with Wyeside’s friendly team as we present 1000+ shows every year. If you are 16 or over and want to get involved, please call our volunteer coordinator Owen Lawrence on 01982 553668, or email him at owen@wyeside.co.uk. Or pick up an application form at the box office, or download one from our website. Please remember to include full contact details - your address, telephone number and e-mail address - and tell us about any particular skills or expertise you can offer to help keep Wyeside growing! CONFERENCES & ROOM HIRE Wyeside’s cinema, theatre and gallery spaces are ideal for events of all kinds - from large presentations to small boardroom meetings. 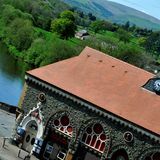 It’s a combination of our flexible facilities, central location, beautiful riverside setting and friendly, efficient service – along with highly competitive rates of hire – that make us such a popular venue for a wide range of conferences, business meetings and private functions. THE MARKET THEATRE, which will accommodate up to 158 in full concert-style seating (plus stage area), up to 200 (standing) with a flat floor, or 100 (seated) with a flat floor. Due to the flexibility of this auditorium, it makes an excellent venue for presentations, performances, group work or even fairs. Struggling to find the perfect gift? Why not buy a Wyeside Gift Voucher - the ideal present for any occasion! Our bar offers a wide range of soft and alcoholic drinks, plus all the ice-cream, popcorn & sweets you can eat! Customers are welcome to take their purchases into the auditorium with them - a rare luxury these days! We feel that there is nothing quite like watching your favourite performer while drinking a glass of locally brewed beer, or cwtching up to a good film with a steaming hot mug of fairtrade coffee. Your voucher can be used to buy tickets for any of our live, satellite live!, or cinema events. Buy your voucher in person from our box office, or call us on 01982 552555 (we can even arrange postage!). Vouchers can not yet be purchased or redeemed online. HOW TO BUY TICKETS ONLINE 24/7 at www.wyeside.co.uk BY PHONE on 01982 552555 IN PERSON at the Box Office Sorry - we can no longer accept reservations. All ticket orders must be paid for when you book. Latecomers may be asked to wait for a suitable point in the performance. CONCESSIONS Satellite Live! & Live shows: We offer concession prices to under 18s, over 65s, students, disabled and unwaged customers. Film screenings: We can now only offer concessions to under-16s. Proof of age/status may be required. Support workers accompanying disabled customers can attend all Wyeside events free. GROUP BOOKINGS We offer tailored rates for parties from schools and other organisations for selected shows only - please contact the Box Office on 01982 552555 beforehand. PROGRAMME CHANGES Times/prices are correct at the time of going to press, but are sometimes subject to changes beyond our control. If you’ve bought tickets in advance, we will make every effort to let you know if any details change using the contact details you gave us when you booked. But - especially if you’re making a long journey - we advise you to check (with our Box Office, or on our website). ACCESS Wyeside offers lift access to all areas, as well as an accessible toilet. Reserved disabled parking is available on our forecourt, and wheelchair spaces are available in both auditoriums. All disabled seating is allocated on a first-come first-serve basis as these facilities are limited due to the restricted nature of our Grade 2 listed building. To guarantee admittance we strongly recommend booking in advance via our Box Office on 01982 552555. Unfortunately wheelchair spaces are not bookable online at this time. Guide dogs are welcome. REFUNDS & EXCHANGES If you’ve bought tickets for a Wyeside event but find you can’t make it, we can exchange them for an alternative date or refund the value (less a £2 admin fee) of the ticket via a credit note – but only if contacted at least 5 days before the event. WYESIDE PATRONS We are grateful to the following for their continued support: Eve Best, Phil Bowen, Tom Bullough, Wendy Evans, Julian Gibson-Watt, The Lord Lipsey, Cllr. David Price, John Walker. Wyeside stands prominently on the end of Builth Wellsâ&#x20AC;&#x2122; famous Wye river bridge, opposite the Llewellyn mural. The centre is only 100 metres walk from the Groe public car park, which is free from 6pm. When you leave the car park, turn left, walk past the Builth bull statue and Wyeside is facing you at the top of the rise.